MIAMI, Florida, October 3, 2016 (ENS) – Hurricane Matthew, one of the most powerful Atlantic hurricanes in recent history, pounded coastal Colombia and is now storming north across the Caribbean headed for Jamaica, Haiti and Cuba. The center of Matthew is forecast to approach Jamaica and southwestern Haiti late Monday and eastern Cuba on Tuesday. NOAA’s National Hurricane Center says Matthew’s maximum sustained winds are near 150 mph (240 kph) with higher gusts, making this a category 4 hurricane on the Saffir-Simpson Hurricane Wind Scale. 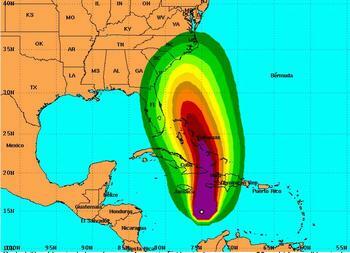 “It’s too early to rule out what impacts, if any, would occur in the United States and Florida,” says Dennis Feltgen, National Hurricane Center spokesman and meteorologist. Briefly blowing up into a Category 5 hurricane on Friday night, the massive storm contributed to two deaths last week, one in Colombia and another in St. Vincent. Colombian officials said a 67-year-old man was swept to his death by a flash flood on Colombia’s La Guajira peninsula, which has been subject to a four-year drought. Matthew could drop up to 25 inches of rain over southern Haiti, with “isolated maximum amounts of 40 inches,” the hurricane center warns. Eastern Jamaica, the Dominican Republic and eastern Cuba could be hit with 10 to 20 inches of rain with 25 inches in isolated areas. Storm surges in the region could cause catastrophic flooding. Emergency officials and residents in Haiti, Jamaica and Cuba are preparing for the hurricane as best they can. The Haitian government has mobilized regional civil protection agencies throughout the county to coordinate the hurricane response. Ahead of the storm, authorities are sending medicine and hygiene kits to areas most at risk. Deforestation across Haiti has increased the potential for treacherous floods and landslides. More than 55,000 internally displaced people are living in tents and could be in danger from the powerful storm. Officials are going on the radio asking people in flimsy homes to move into schools and churches. The “Haiti Gazette” reports that 89 people were evacuated from rising storm surge Sunday from the Abreu islet near Ile-à-Vaches. Jamaica has activated its National Emergency Operations Center and Prime Minister Andrew Holness called an urgent meeting of Parliament to discuss preparations for the storm. People cleaned store shelves as they stocked up on food and water. Sunday night Local Government Minister Desmond McKenzie urged people in low-lying and flood-prone areas of Jamaica to get to the nearest shelter, “The Jamaica Observer” reports. The government has buses available to move willing residents to shelter at the National Arena in Kingston. The Salvation Army is partnering with government authorities to help facilitate the evacuation of residents in low-lying areas of impact, McKenzie said. “The Salvation Army is assisting the Government, and thus far we have been able to move a large number of these homeless people off the streets, and for that, we are very grateful,” McKenzie said. McKenzie warned that the country’s infrastructure cannot withstand the expected winds and rains. Cuba has declared the first stage of an emergency in five eastern provinces. In Santiago de Cuba, shelters are open and volunteer teams are clearing storm drains and gathering food supplies. Some 700 non-essential personnel and family members of military personnel were evacuated from the U.S. Navy base at Guantanamo Bay ahead of the storm. Base commander Navy Capt. David Culpepper notified residents to begin evacuating on Saturday. About 5,500 people live on the base, including 61 men held at the detention center. “As Hurricane Matthew continues to track northwest through the central Caribbean, the U.S. Agency for International Development, USAID, is carefully monitoring the situation and preparing to assist governments and communities in the region,” said USAID Administrator Gayle Smith. “As the Caribbean prepares for Hurricane Matthew, the United States Government stands ready to quickly assist the governments and citizens of the region,” Smith said. USAID’s Office of U.S. Foreign Disaster Assistance has deployed two disaster response teams to Haiti and Jamaica in advance of the storm’s arrival. These disaster experts are actively monitoring the storm’s track in real time and communicating with officials in Jamaica, Haiti, Cuba, Dominican Republic, Bahamas, and Belize to coordinate relief efforts, if requested, said Smith. USAID has strategically pre-positioned emergency relief supplies, including shelter materials, blankets, hygiene kits, household items, and water purification equipment, to ensure they are available to help the affected communities.